SPRING, WHERE ARE YOU? How creepy is that, when you wake up & you see rain, you put your jacket on & suddenly a HUGE sun is out for the day? Yes, the weather in Switzerland is being more and more strange. I never know what to wear, because it's always changing mood. At least, my blazers always save m in those times & I promise, new outfit pictures are about to come. Let's now take some time to talk about some brand new goodies. When Emily was here, we took some time to make a little bit of shopping, but like always, when you want to buy & when you have enough money to spend, you find NOTHING! That was our case. But l least, we found some goodies that we are pleased to show you! Let's start with Rafaela's goodies. My new crush. Everytime I went to H&M, I was just dying to have this bikini by my side. And now, it's a dream come true. My new wish? Summer. Another H&M crush. It's the perfect dress for summer, it's so floppy. My very first watch from ASOS. The bracelet's color are so gorgeous. My two new blazers from Zara. You dolls know how much I love blazers and when I saw these two, I just couldn't resist. Plus I didn't have white blazers. Candles are my little pleasure those last days. I had the chance to find a shop where they sell the most AMAZING candles I ever seen and smell. They come from the USA and this brand have lots of fragrances. The last two pictures aren't purchases. At least, not mine. These are little presents from Emily and God, I love them so much, just like her! The mask came from Italy, from her last trip to Rome and the box is from ''Glossy Box''. I want to thank her for those amazing gifts, they mean the world to me. There are my new super cute ballerinas . I mean , there are so amazing ! White ,with some details crochet and delicate. Love them ! Even if I'm afraid to wear them for not dirty them.. Hm. 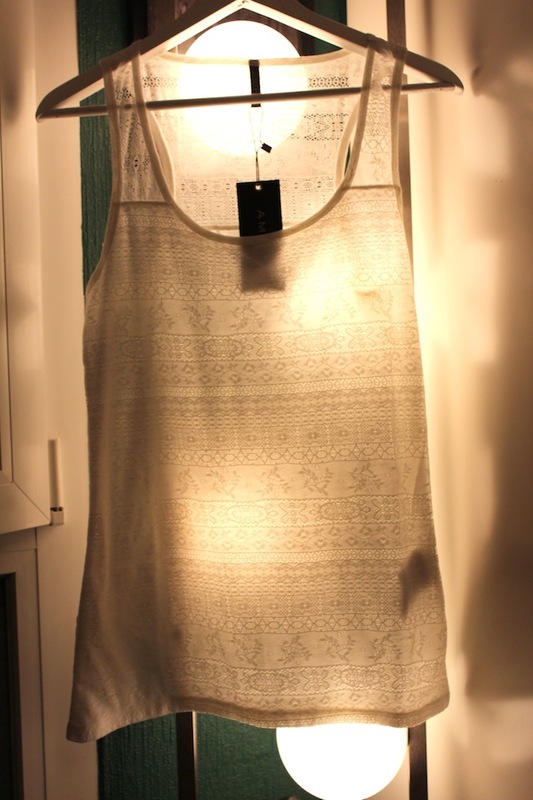 One of my new top , from "New Yorker" , it is white and also very cute. Perfect for summer with an amazing tan ! 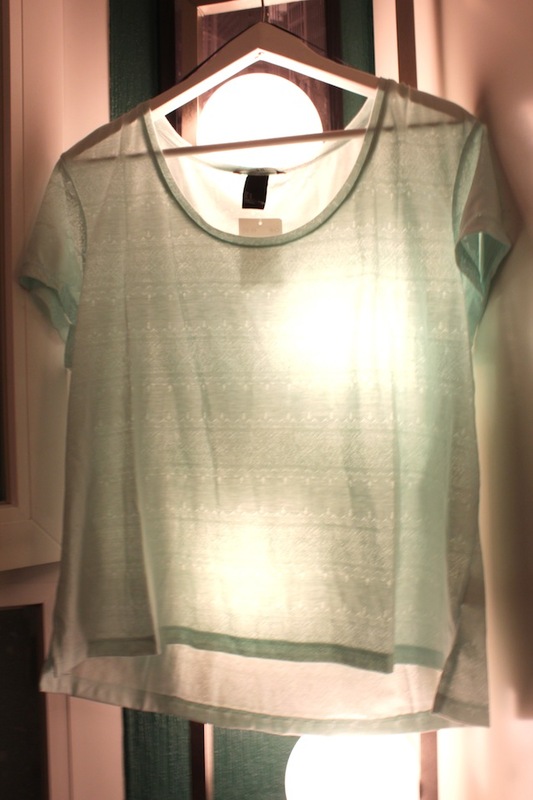 My H&M mint top ! Love it ! Simple but in harmony with the colours of the summer ! Also great with a denim short! My big crush is this dress by H&M from the collection "Conciencous Collection". I tried it and.. I looked like a little doll. The back of the dress is gorgeous , this dress become less "strict" with the back , this is probably why I love it so much. 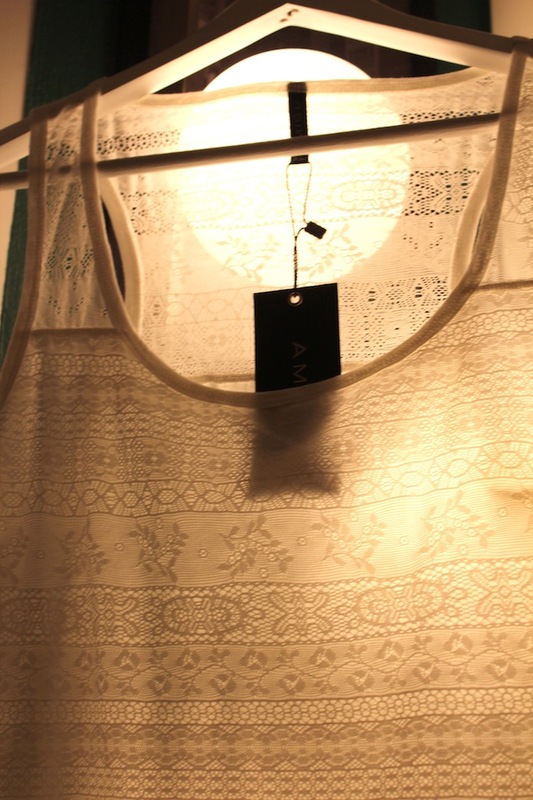 The colour is a pale rose , with a lot of lace. Amazing. The article starts with Rafaela's bikini and here's mine ! Yes you saw good ! This is the same model but not the same colour , actually I had a bigggg cruch on Rafaela's one but it wasn't good with my skin color and this one was really better plus it's close to my eyes colours aha ! Have a great Monday night dolls ! les 2 maillots de bain (corail et prune) sont géniaux ! so so many great clothes :-) I have the same balerinas from H&M :-) but in different colour. Thank you for your comment! Really nice. I really like your blog as well! I like that you're in this together, must be so much fun! I started following you two. Follow back ;) ? I love this pastel items!!! Tell me if you follow me back on GFC or fb! Thanks for the comment on my blog! :) I am following you now :) That coral color swimsuit is adorable!! Loving your blog! Thanks for stopping by at my blog and commenting.. I already follow you hope you follow me back!! o I love everything. The bikini, the laces, de cosmetics,...I wanna them all. Thank you for your sweet comment, of course I don't mind to follow each others. Wow... nice stuff! I love them all! Girls, you made some pretty amazing purchases!!! I love them all, especially the bikinis and the blazers! They are so chic! I really like the layout of your blog and your main pictures!!! Emily, thank you for your lovely comment on my blog! Of course I wanna follow you! I do it via GFC and Bloglovin and I hope you will follow me back!!! I must make a trip to H&M! My favourite is the shirt dress, so cute!!! I love the blazers, great post! Thanks for leaving a comment on my blog josscrapbook.blogspot.com ! I started following you and I'd really like you to follow me too if you don't mind. H&M always has such great stuff! I love your entire haul!!! I love the masquerade mask! IT is so beautiful! I love this post, great items. Great jacket (white ). Thank you for your comment.